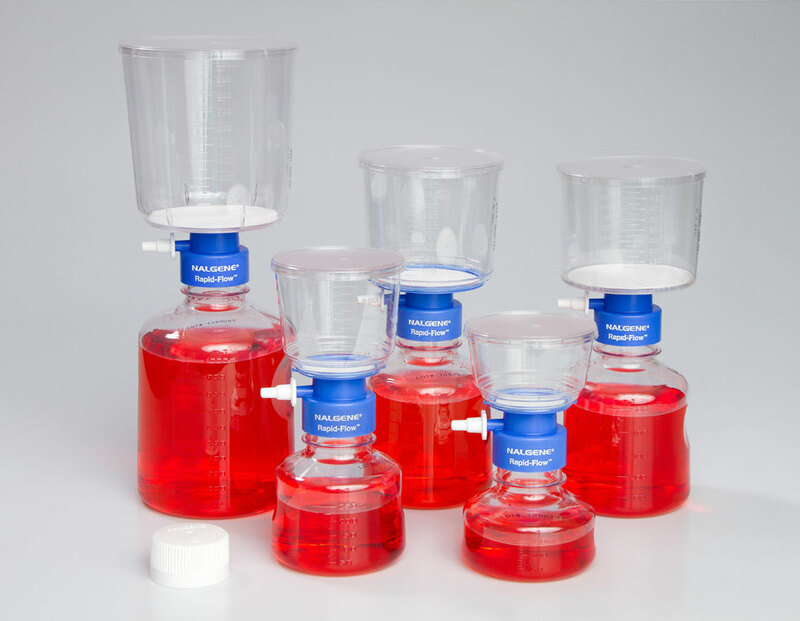 All Nalgene filters now have the Rapid-Flow multi-column membrane-support system. This roprietary system provides a uniform, consistent separation between touchpoints with the membrane, minimizing gap stress to maintain optimal flow. Other filters use a radial spoke support system. The gaps between spokes lack uniformity and consistency in membrane support, leading to increased stress and distortion. The result show suboptimal flow rate and throughput. 0.1 micron filters guard against mycoplasma contamination. 0.2 micron filters remove all bacteria. 0.45 and 0.8 micron filters for particle removal and fluid clarification. 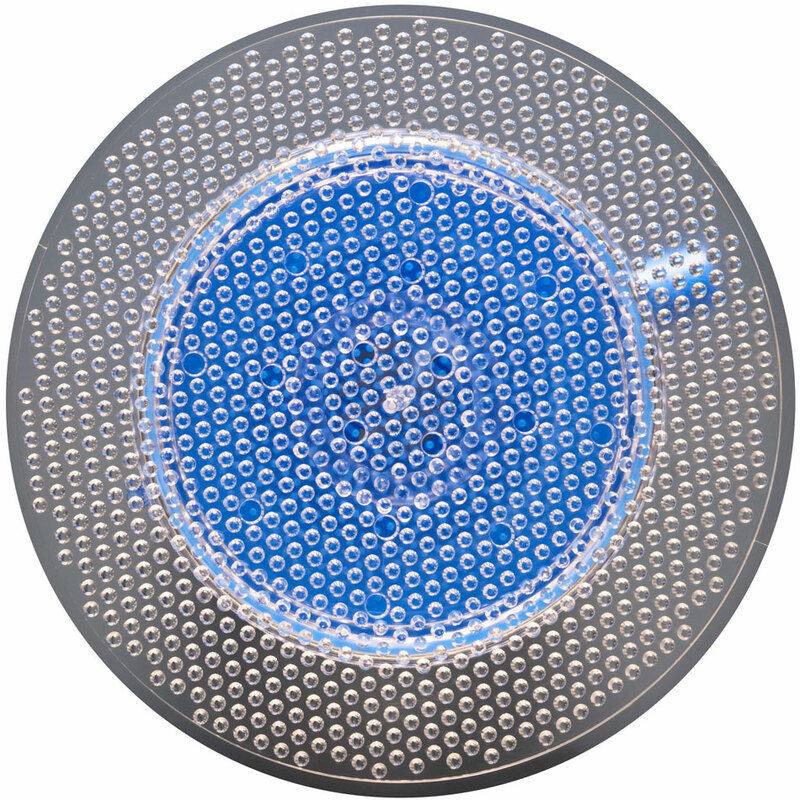 90 mm diameter filters provide large surface area for serum and other hard-to-filter solutions. Nalgene Certified. We guarantee it! PES (polyethersulfone): The best choice for cell culture. It’s fast and clean. PES is low protein binding, so there is less chance of removing critical protein from your media. It is hydrophilic, so no external wetting agents or surfactants are needed, resulting in low extractables. And it is fast, so you spend less time waiting. SFCA (surfactant-free cellulose acetate): (SFCA) contains none of the wetting agents found in standard CA (cellulose acetate). These wetting agents have been shown to be toxic to specific cell lines in vitro (1-3). SFCA also has lower protein binding than does standard CA. If you must use CA for media filtration, you owe it to your cell lines to switch to SFCA. 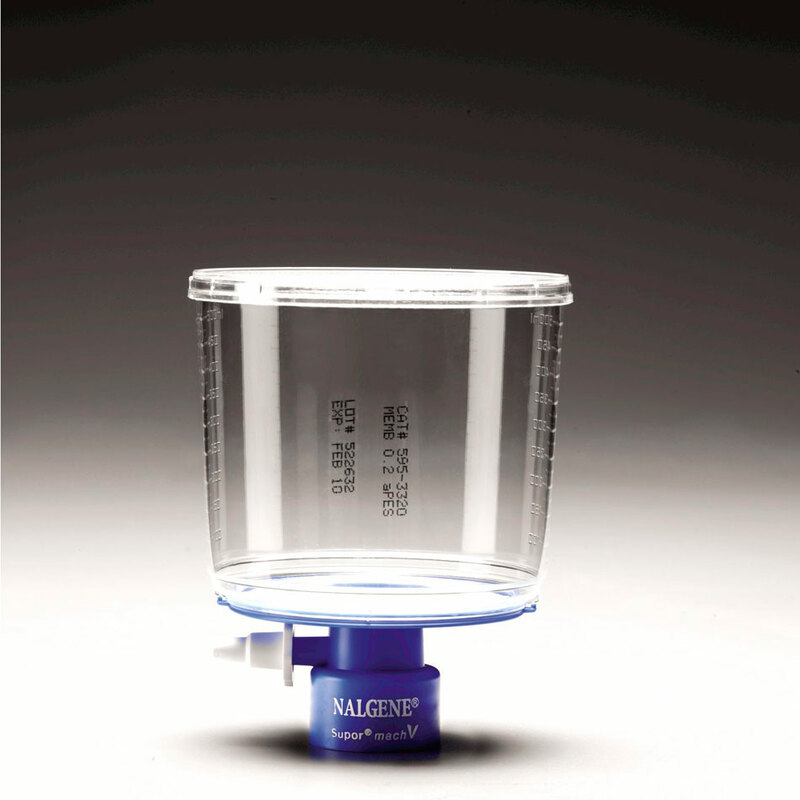 SFCA is available only in Nalgene filter units and bottle top filters. CN (cellulose nitrate): Ideal for filtering and clarifying buffers and other aqueous solutions when protein binding is not a concern. Nalgene CN membranes are TRITON X ® -free. NYLON: Nylon is tough, alcohol resistant, and has a low level of extractables. These membrane factors make it the choice for special applications.